A Nice Corset to Wear.. for Short Periods of Time Only! The lace taffeta corset by Coquette is pretty, though there were quite a few loose threads, and seams coming undone. The most unpleasant part of wearing this corset was the trim underneath the armpits. After an hour or so of wearing the corset, the trim started to irritate my skin. As time went on, it just got worse. This corset would be best for someone who only plans on wearing it for a short period of time. The lace taffeta corset by Coquette arrived rolled up, wrapped in hot pink tissue paper. The hot pink tissue paper was the only packaging for the corset. The shoulder straps and garters were in little plastic zip-lock style bags, along with a cardboard tag that stated the brand, and had a photo of a model wearing the corset. The corset is available in sizes S-1X/2X. I ordered the size XL, and it fit me comfortably on the second row of hook closures (tightest fit). 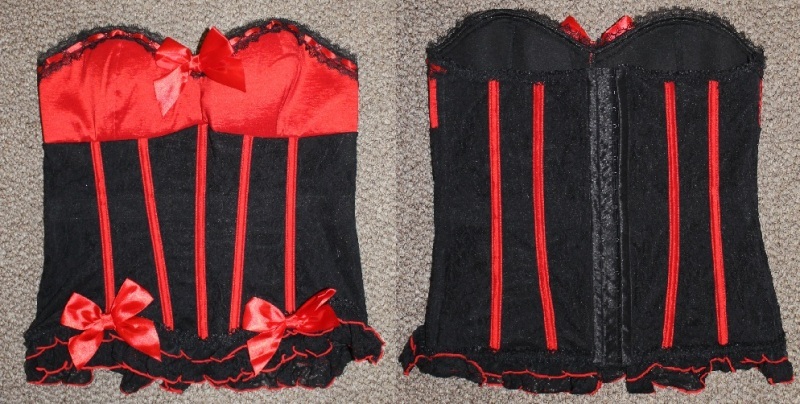 I had ordered this corset with the intention of wearing it out, underneath a black cardigan/sweater/etc. I do this with most corsets, as long as they are not sheer or too revealing. The corset is 100% nylon, exclusive of the trim. The corset material is extremely stretchy. Aside from the stretchy material, there is also an elastic band on the inside of the corset that runs all the way around the corset. The elastic band is 1 ¼ inches wide. Below you can see the outline of the elastic band from the outside of the corset. The measurements I have taken are of the corset laying flat, unstretched. The corset was done up on the first row of eye closures (loosest fit). If you need additional measurements, please feel free to send me a message. The corset does up in the back with hook and eye closures. There are two rows of eye closures, with a ¾ inch gap between the two. There are 18 eye closures in each row. Both shoulder straps and garter straps are detachable and adjustable. The pieces that straps attach to are on the inner part of the corset, so if you were to choose not to wear them, it would not look awkward. I don’t wear the garter straps because I like wearing corsets with a pair of jeans, but I do prefer wearing the shoulder straps to hold the chest part up. 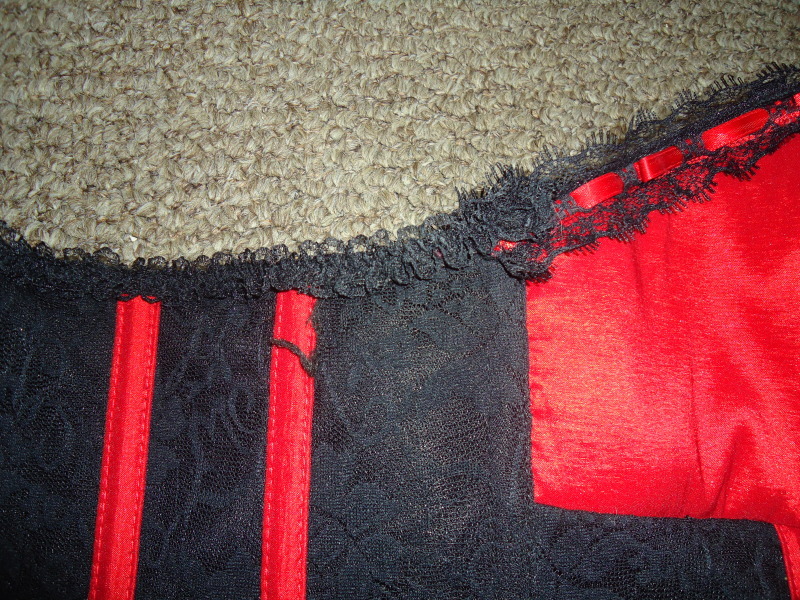 Below is a photo of the detachable, adjustable garter straps and shoulder straps. The top strap is the garter; the bottom strap is the shoulder strap. There are 11 boning pieces in total; 5 down the front, 4 down the back, and 1 down each side. The boning is a flexible plastic. I did not find that the boning held anything in, nor did it shape my middle area. The boning is far too weak to do any sort of shaping. All three of the bows are detachable. The bows are glue gunned onto safety pin style clips. I find that all three of the bows are a bit much, so it’s nice that they can be removed. All of the bows are approximately the same size: 4 ½ inches in width and 4 inches in length. On the bottom of the corset, there is a ruffled lace trim that is ½ inch thick (this trim is also on the top, back of the corset). Below this trim, there are two rows of ruffles. The top ruffle is a mesh material, and the bottom ruffle is lace. There is no underwire in the chest for support. There is a thin padding though, so a bra is not required if you were to wear the corset out in public. As for my personal experience with the corset, I am not completely satisfied. 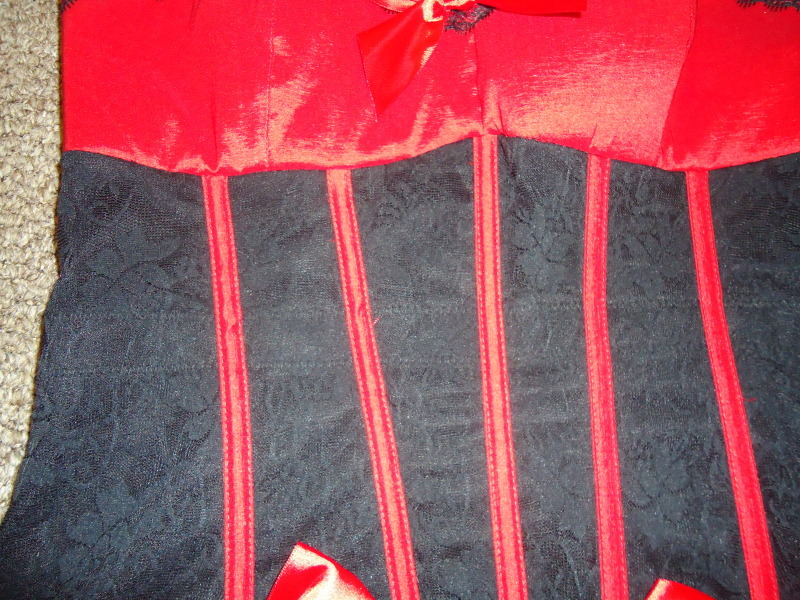 The seam right below the bow in the middle of the corset seems to already be coming apart. Also, the seams that run down the centre of the cups seem to be different, which I feel looks a bit odd. It’s not terribly noticeable from a difference, but up close the differences can be seen. Also, on the back of the corset, there were a few loose threads. Below is a photo of me wearing the corset. The last photo is how I would wear the corset out in public. When I had worn the corset, at first it seemed comfortable. I had worn it out with a pair of jeans and a black open sweater. After an hour or so, the lace trim that begins under the armpits and continues around the back of the corset, really started to irritate my skin. The lace is quite stiff, and scratches against the skin. This wasn’t a problem within the first hour, but after that, it just got worse. If you were to wear this corset for a short period of time, this should not be a problem. Unfortunately for me, I like wearing corsets when I go out, so this corset really does not cut it for me. Below you can see a photo of the lace underneath the armpit that irritated my skin. The care tag in the corset says that the corset should be hand washed only, and to hang dry. Overall, the corset deserves a 3 out of 5 rating. It’s not terrible, but it’s not wonderful either. The flaws in the seams, and the itchy material under the armpits are the reason why the corset has lost 2 stars. This corset would be nice for someone who plans on wearing it for very short periods of time. Thank you for viewing Lace taffeta corset review page!